Composr provides a number of ways to deal with the annoying users or the users who do not adhere to your site policies (for a good discussion of site policies see the Legal and social responsibilities tutorial). Some of these tools actively enforce your policy, some of them allow you to 'moderate' to maintain your own policy, and some of them provide punishment for users that abuse policy (such that they may be removed from causing further harm, or made an example of such that other users do not 'follow suit'). 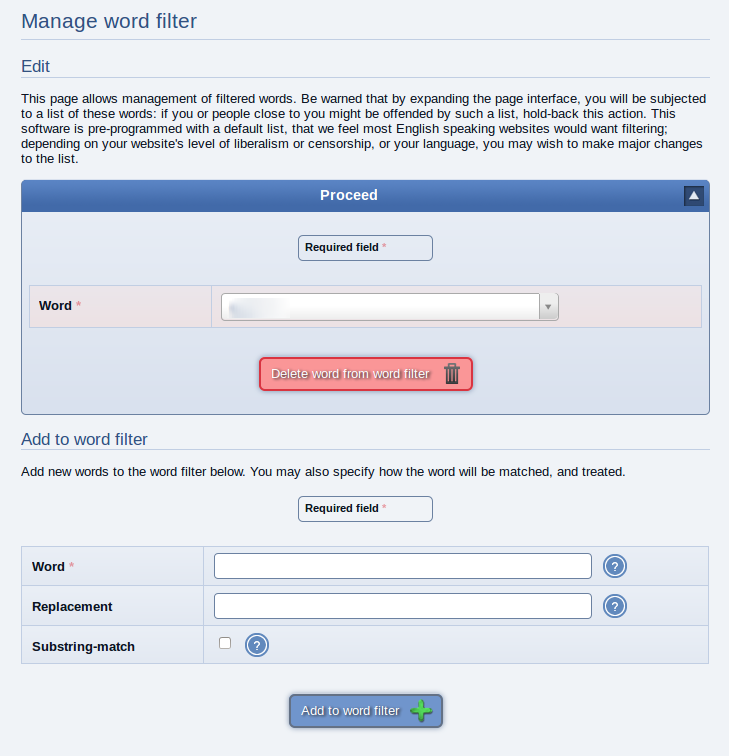 There is a simple word filter which will allow you to prevent a list of words from appearing on your site, unless the user that posts them has the privilege to bypass the word filter. 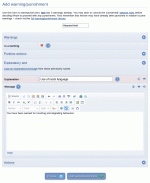 Admin Zone > Security > Word filter. The word filter makes no attempt to try and detect when users try to 'cheat it', as this would be a futile struggle: if users abuse the filter, then they are almost certainly knowingly that they are doing so, and thus setting themselves up for punishment. 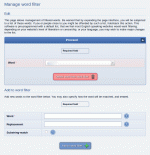 In addition to the word filter there is a more sophisticated filtering system, the The form field filter system. Composr, by default, will not allow most forms of non-trusted content to appear live on the website without validation by the staff. When a user that is not in a trusted usergroup posts content, then they will have no choice but to have it posted as non-validated, and a notification will be dispatched to the staff. The staff can then choose what to do with the content (as part of their "moderation" duties). By default, the forum, the chatrooms, and Wiki+, are the main exceptions where validation is not required. This is because these are community orientated areas of the website, where instant posting is desirable. Naturally, privileged users may edit and delete any content on the system; by default, these privileged users are those in the staff usergroups. It is possible to configure Composr so that users may edit/delete their own content though, or even all content if you like. It's a common practice to use rank to automatically grant additional access, such as bypassing validation. 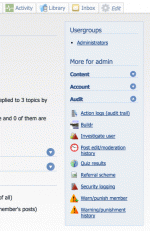 Rank is discussed in the Tools for subsites and subcommunities tutorial. Members may specify the privacy settings for content they post, if the content_privacy addon is installed. For example, they may post an image and set it so only their friends may view it. Charging points to the member or giving them a negative number of points (which might result in sustaining a reduced rank for a time, if you also moving them down to a lower ranking usergroup on the rank scale). 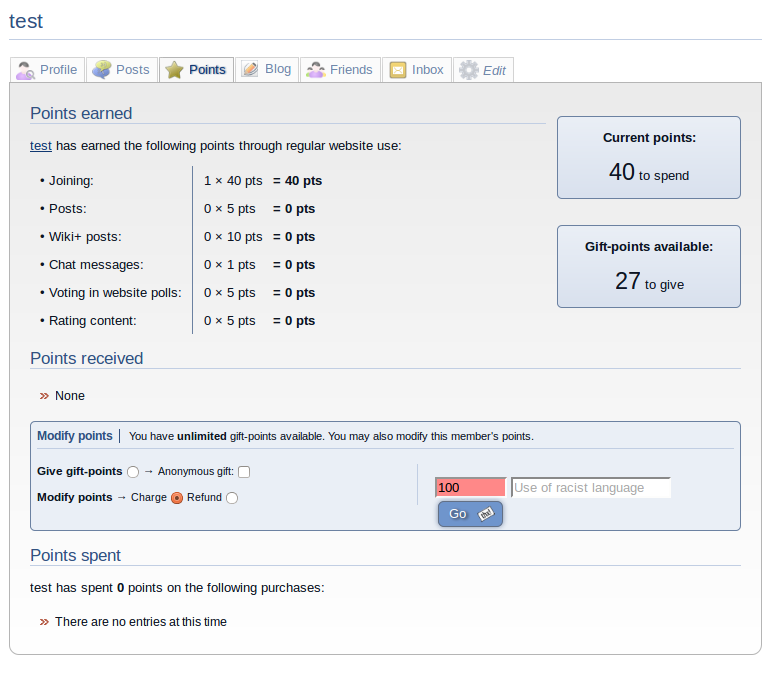 Points are primarily charged from a member's points profile (in Conversr this is a member profile tab, otherwise it's via the points module). Banning them in various ways described under "Banning"
Moving them to a restricted usergroup (there's an inbuilt "Probation" feature to move them automatically into probation usergroup for a limited period of time). This is done by editing their account settings or via the warn/punish form. 'Verbally' (unofficially) warning them, via a Private Topic. Giving them a formal warning (read on). As all these methods work on members, but not users in general (i.e. not guest users), you may wish to consider making it a requirement for all users to join in order to participate on the website. In other words, you may wish to remove permission for guests to make submissions. 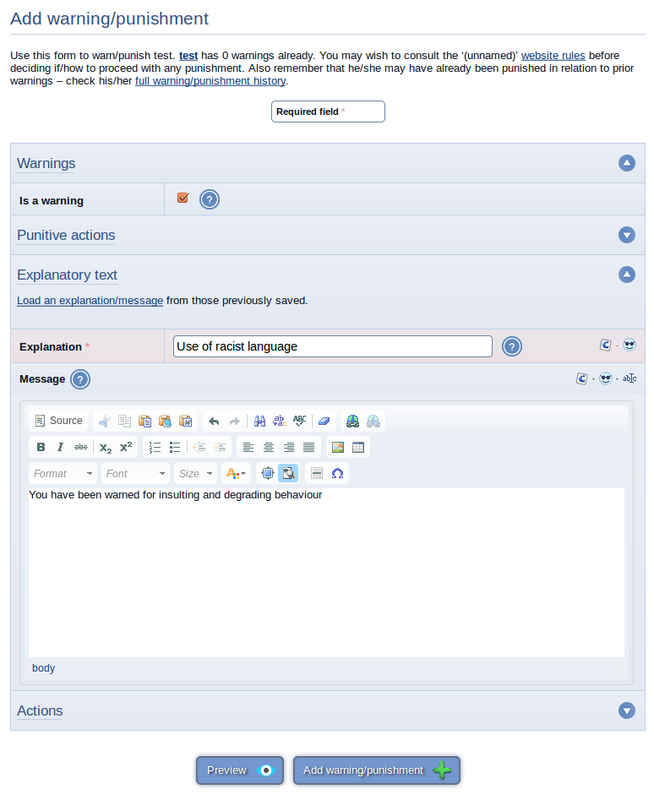 All the various punishment tools are brought together for convenience on one screen named "Add warning/punishment" (Conversr only). This screen is the only way to make warnings, but the other punitive actions can be carried out in other places also. The probation feature is designed to work via the punishment system. You could manually put a member into the probation usergroup, but it's not advisable because any secondary usergroups they are in may lead to extra undesirable privileges. The recommended method is to set the time until which they finish probation, either via editing their account or using the warn/punish form. If you use the punishment system to put a user in probation, Composr automatically returns their only usergroup as Probation, disregarding other settings until their probation expires. Their usergroups will continue to display as normal, but from a permission point of view, they'll only be in the probations usergroup. Banning a member via editing their member account. This is perhaps the most useful method of banning and shows them an error when they next log in telling them they've been banned. Note that there is no way to prevent a user re-joining with a new username. Banning an IP address, or IP address range. Banning IP addresses is useful to totally remove a user's ability to access the site; unfortunately, users can very easily switch IP addresses so it is not a perfect tool. More information about IP addresses is given in the Using IP addresses to trace users tutorial. Banning a member via changing their usergroup to one with virtually no privileges. This is useful if you want to reduce access in a highly customised fashion. Banning member submission. 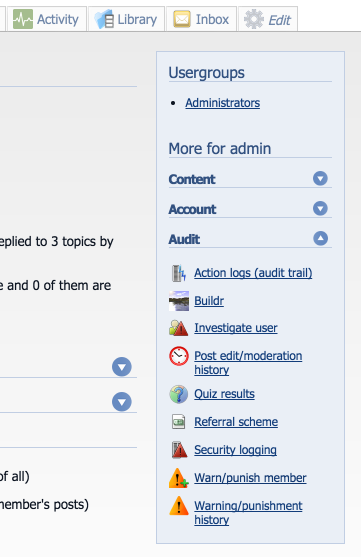 This is useful if you only want to ban a member from making submissions, and not the whole site; it is done from the Action Logs module (accessed from Admin Zone > Audit > Action logs). 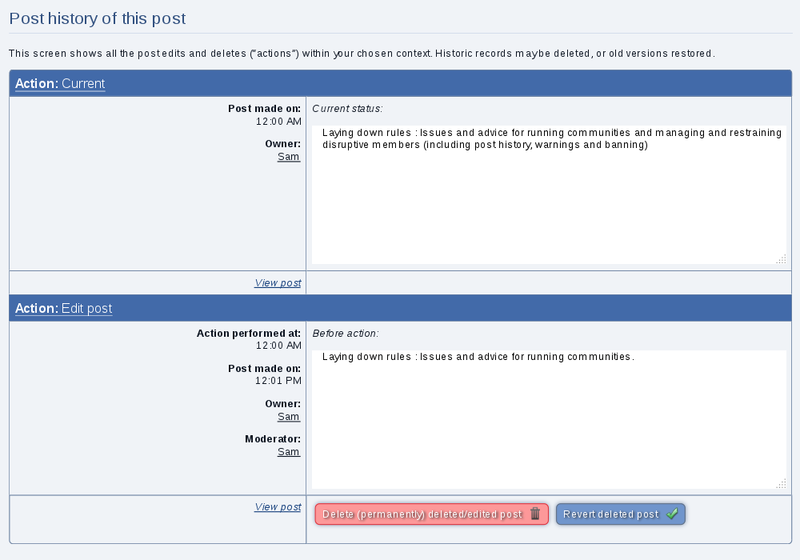 This feature is also useful if you are not using Conversr , and want to ban a member in Composr, but not in the forum. 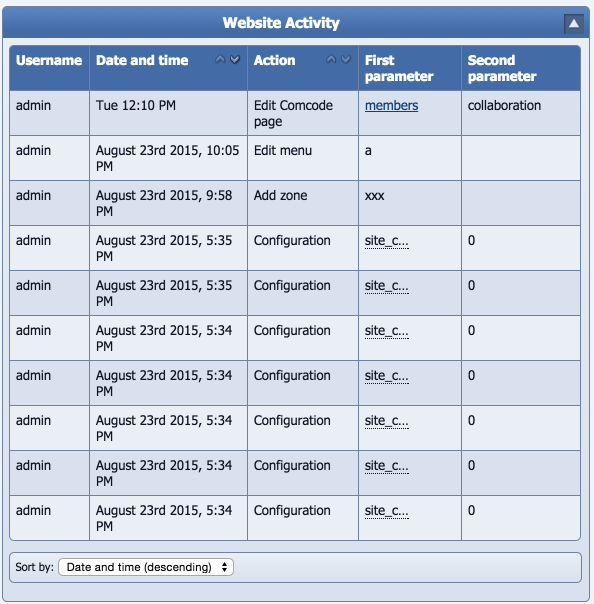 The action log will allow you to trace what actions have been performed on the site; and where given, the reasons for doing them. This log gives a combined view of submission, administration, and moderation actions, and provides integration with the tracing and IP banning modules, as well as submitter banning of its own. 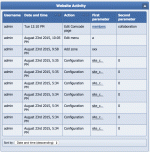 This module shows the recent actions performed by you and your staff. Virtually every action that is done by your staff is logged here. IP Address is the IP address of the member who performed this action. Date and Time is the date and time when the action occurred. You may click this date to view further details on the submission as well as do (un)banning related to it. Action is the name of the action they performed. First Parameter is one of the parameters of that action – which will differ from action to action. Second Parameter is one of the parameters of that action – which will differ from action to action. There are also 'sort by' and 'show per page' options at the bottom of this module to help you refine which recent actions you see. the ability for staff to eternally erase posts from the history record.